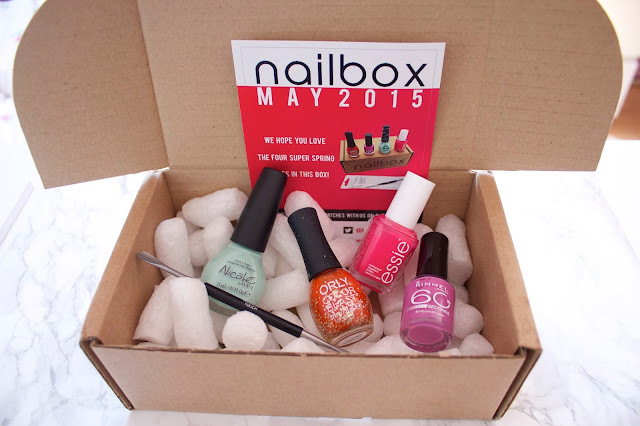 I was super excited when I was asked by Nailbox if I wanted to try out one of their boxes, I have been growing my nails for the past three months and focussing on making them stronger and healthier. I also have them painted 24/7 in order to stop me picking and biting them so I couldn't pass up an opportunity to try out some new nail polishes! There are a few different options depending on how many boxes you would like to buy, you can order an annual subscription or even just have a one off box! In this box I received an Elegant Touch Cuticle Pusher which is great as it makes your nails look so much longer and neater! I received four nail polishes, Essie Status Symbol, which is a beautiful bring pink and my new favourite shade, especially for the summer. I love Essie polishes so was very excited to get this in the box. Nicole by OPI - Alex by the Books was the next one, this is very similar to Essie Mint Candy Apple, a nice, bright summery blue. Another Essie dupe is Rimmel Lucky Lilac, very similar to A Splash of Grenadine, one of my favourite shades of all time so I know I will love this! The final one is Orly - Fiery Orange, this is one I probably won't get as much use out of however it is still a lovely shade! Overall, I love the idea of the Nailbox. I also love the fact that you get well known brands like Essie and OPI and I think you really get your money's worth with each box; perfect for nail painting lovers! What do you think of the box? Wow I really love the Essie polish!